Two years ago Wyatt E. introduced themselves discographically with their debut "Mount Sinai/Aswan" (review in Greek language). What I didn't know back then was that their debut was in fact the first part of a "soundtrack" they were planning to complete it in six parts. The main concept is to create a soundtrack of a fictional pilgrimage taking place in a different time somewhere in the ancient Orient. "Wyatt E. writes a soundtrack to a travel in the Orient in which your fantasy is the main means of transportation. This pilgrimage takes you to a place unspecified in time nor place and portrays an Orient as it is seen from the point of view of our Western Culture." "Exile to Beyn Neharot" is the second part of this soundtrack, consisted of two tracks with a duration of 19(+) minutes each. The band definitely seems to have worked further to produce much longer compositions than their first release. For those unfamiliar with the sound of Wyatt E. I should note that their music is a peculiar mix of instrumental doom, drone, ambient and post-rock with a big dose of oriental musical patterns. The instruments used are guitars, drums/percussion and synth effects. Despite the experimental attitude of the band, the fact that Wyatt E. chose to create a soundtrack like the one described above, set a pretty clear path for their musical directions despite their experimental attitude. Although I have a feeling that we have a lot of new stuff to see in their following 4 releases, especially concerning the use of new instruments and sounds. The current members are also involved with other bands of different genres and musical directions but they all seem to share a common passion for experimentation and Wyatt E. is the living proof. In this album the main 'recipe' of Wyatt E. remains pretty much the same as in their debut although it clear that the production has improved a lot and the band embedded even more oriental elements in their music. 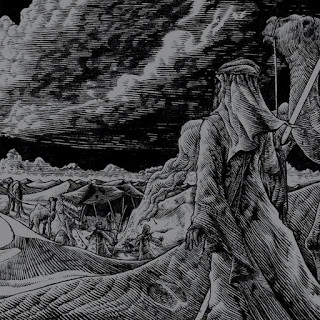 Some heavy but atmospheric guitars, oriental synths, slow tempos and recurring patterns that always lead, slowly, to a kind of ecstatic climax which in the case of "Nebuchadnezzar II" occurs at the end of the track with a post-rock styled but heavy and dark crescendo and in "Ode to Ishtar" occurs twice, first in the middle of the track and a second time 5 minutes before the end.